Formerly known as the Metro VAC N GO 500, the Metro High Performance Evolution Hand Vac 500 has an updated look that features a black end cap. It's the same machine it's always been - just with an updated look! The only 500 watt hand vacuum you can buy is available with a 3 ft. extension hose! The Metro High Performance Evolution Hand Vac 500 is ideal for quick cleanups around your vehicle, but you can improve its performance by adding the Metro Hand Vac 3 Ft. Hose. 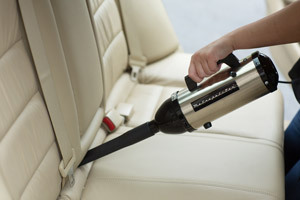 The flexible hose extends the reach of the Metro High Performance Evolution Hand Vac 500 to give you greater access under seats and into tight spaces. The Metro High Performance Evolution Hand Vac 500 is a new and improved version of Metro’s Vac N Go hand vac that they’ve made since 1957. The Metro High Performance Evolution Hand Vac 500 has an amazing 500 watts of power and 55+ inches of water lift. No other handheld vacuum comes close to the power of the Metro High Performance Evolution Hand Vac 500! The Metro High Performance Evolution Hand Vac 500 is the only handheld vacuum that packs 500 watts of power into a 2.7 pound body. The vacuum is lightweight, portable, convenient, and – most importantly – it has incredible suction! Use the two included attachments to clean up around your vehicle or your home. The Metro High Performance Evolution Hand Vac 500 is based on Metro's original 200 watt handheld vacuum they started manufacturing in 1957. They were the first company to produce a hand vac and they’re now the first to create one with such power. The Metro High Performance Evolution Hand Vac 500 features a state-of-the-art fan enclosed motor that generates 110 volts at 4.5 amps. This motor produces 55+ inches of water lift. To give you an idea how strong that is, an average full size household vacuum has 70 inches of water lift. The Metro High Performance Evolution Hand Vac 500 comes closer to the power of a full size than any other hand vac you can buy, yet all this power is packed into a small 2.7 pound vacuum. That's more than enough suction to clean up crumbs, dirt, sand, and just about any other mess inside your vehicle or home. The Metro High Performance Evolution Hand Vac 500 is powered by a standard 110 volt household outlet. The vacuum includes a crevice tool and dust brush. The Metro High Performance Evolution Hand Vac 500's compact design makes it ideal for RVs and offices! Its attractive stainless steel finish brings together form and function beautifully. The Metro High Performance Evolution Hand Vac 500 has 55+ inches of water lift to thoroughly clean carpet and upholstery. Get your hands on the only high performance hand vac in the world! The Metro High Performance Evolution Hand Vac 500 is the only handheld vacuum that has 500 watts of power to quickly clean up any mess around your vehicle, home, or office. LITTLE VACUUM CLEANER SHOWS GOOD POWER TO REMOVE PET HAIR FROM SEATS AND CARPET!! A NICE UNIT WITH GOOD SUCTION TO REMOVE MOST PET HAIR FROM MY CARPET. Small, powerful, light and has great suction. Easy to work with and pleasure to use. ProsThree foot hose is useful. This device is impressive. Bought it during the Black Friday/Cyber Monday sales. Tried it briefly in the car and was blown away by the amount of suction. More than a household vacuum. Definitely more than my cigarette lighter plug-in Black and Decker portable. In a nutshell, this device is worth the money.